This card can only be place on the next player. At the beginning of that player's turn, they may unfilp their character card or unchain themself. At the end of their turn, this card moves to the next player. 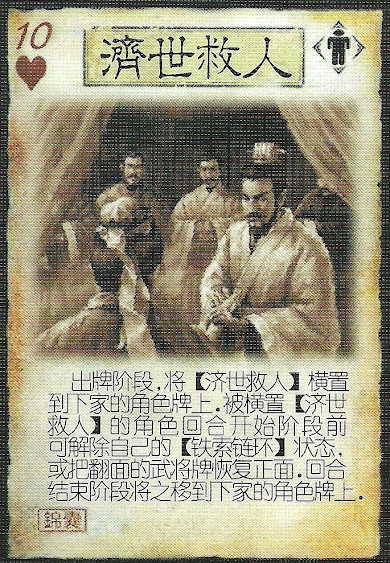 This card can be used to unfip someone at the beginning of their turn so that they will be able to take their turn. This card can unfilp someone or unchain them. It does not do both at the same time. This card can go on only the next person in the turn order. The reach for this is unlimited, but the person that this targets cannot be altered. This card can be targeted with a Break or Steal, just like any other delay tool card. A Negate can be used to stop this card, but it is used at the beginning of the turn and not when the card is played. After the Negate is used, the card moves on to the next player at the end of the turn, just like Lightning.